Although the pedestal is damaged, the statue is still there. 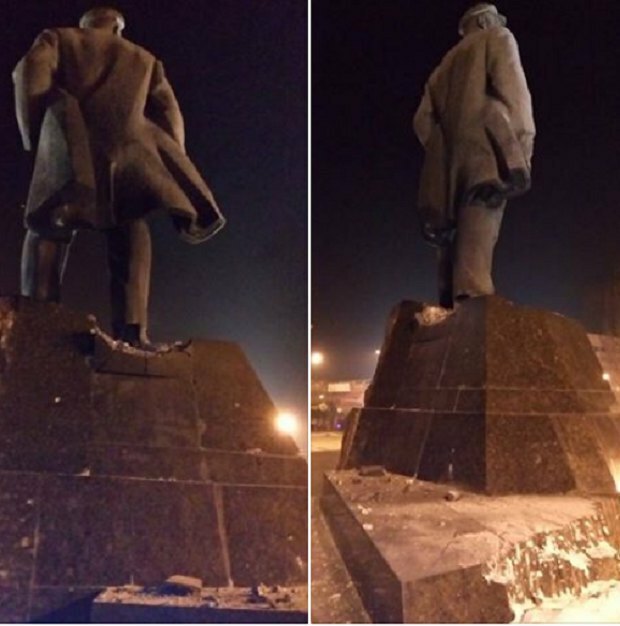 Unidentified individuals attempted to blow up the Lenin monument in separatist-held Donetsk last night, a correspondent of the Russian Foreign Ministry's press service, Roman Manekin, has said on Facebook. He recalled that the same monument was earlier painted yellow-and-blue, the colours of the Ukrainian flag, and said he was indignant that the curfew was not observed. "Where were the police which had its special booth installed right on this square? Where is the curfew? Where are Donetsk Communists after all?" he said. The Donetsk separatists blame Ukrainian saboteurs for the incident. On social media, bloggers are making fun of the explosion, saying it was organized by the Donetsk separatists inspired by Russian President Vladimir Putin's speech in which he blamed Lenin for the collapse of the USSR. Donetsk separatists report attack on "defence minister"